This month’s post was written by NBA member and Historic Preservation Consultant, Carla Cielo. She has been working hard for many years to raise awareness of historic barns in her area and will be featuring some of the results of this work during the first-ever Dendro-Dated Barn Tour later this month on October 17th. • When did the Pennsylvania Forebay bank barn form migrate from Pennsylvania into Holland Township, New Jersey? • Does the earlier ground-level, three-bay, swing beam barn type predate German migration from Pennsylvania? • Was the ground-level, three-bay, swing beam barn type built during the 1750-90 tenant period? • Did a much lighter style of timber framing migrate from Pennsylvania along with the forebay barn form? 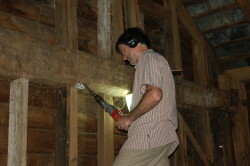 The results of the first 10 barns tested will be published this fall along with the first ever dendro dated barn tour. Editor’s note: As mentioned in the introduction, Carla is leading a FREE barn tour on October 17th that will feature several these dendro-dated barns and other structures in Hunterdon County – see details below! 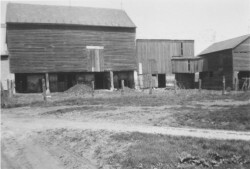 Tour five barns (1787 to 1825) that have been dated with dendrochronolgy; two ground-level, three-bay, swing beam barns, two Pennsylvania forebay bank barns, and one hybrid. Please call or write Carla Cielo for the meeting place.